Chicken and Mushroom Risotto, Thyme for Cooking comfort food. This uses Red Pepper Coulis left from White Bean Soup. (It would be a perfectly lovely risotto without it.) 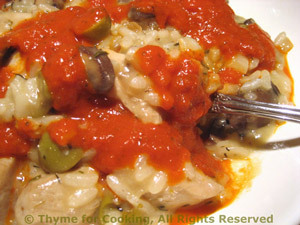 We could just stir the Red Pepper Coulis into the risotto, but I liked the idea of drizzling it over the top for an occasional 'bite' of flavor. And it's prettier! Heat oil in small skillet. Add onion, mushrooms and sauté until tender. When vegetables are tender and add chicken and herbs. If using raw chicken, sauté until cooked through. Stir in olives, cover, turn heat to low and keep warm until needed. Gently reheat red pepper coulis and keep warm until needed. Drizzle with Red Pepper Coulis. Serve.